I can't help but think of it as a guilty pleasure. Sitting down yesterday to play through a chunk of Disney's upcoming button-mashing adventure game Pirates of the Caribbean: Armada of the Damned, I wasn't expecting an experience that shook the tenets of game design or innovated in some surprising way. What I was expecting, and what I got, was a solid, well-designed, interesting looking action title starring pirates. There are some interesting design elements in the game. The key one is that early in the title you'll be asked to decide whether you want to play as a Legendary or Dreaded pirate. Legendary pirates seek out fame, while Dreaded ones seek out power. 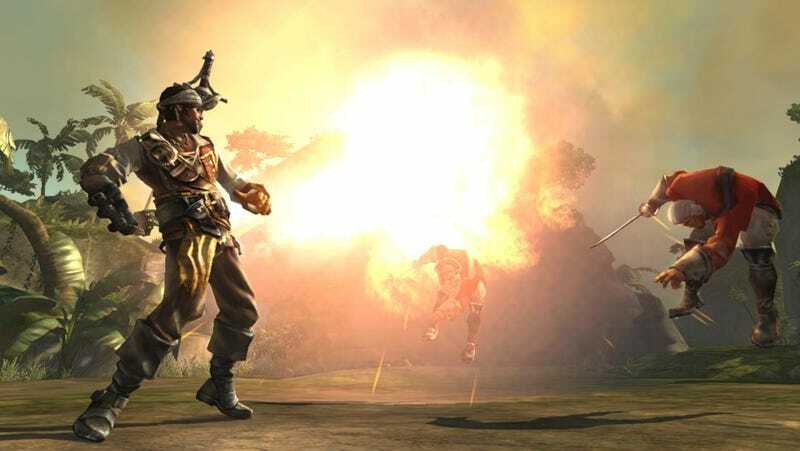 That decision and the choices you make throughout the game will influence your pirates looks and abilities as well as the quests you end up receiving. Another neat new element is the ability to create and customize your ship. The developers say they want you to care as much about your ship as you do your pirate. My time with the game started out on an island where I was trying to retrieve a figurehead for my ship. The island, it turned out, was cursed, turning the people who lived there into nasty crustacean-looking creatures. Combat in the game involves mashing light and heavy attack buttons as well as using a third button to fire your pistol. I also unlocked the ability to douse an enemy with a flammable liquid an set them on fire. The fights were pretty straight forward, with a bit of flare but not the amount I'd like to see in a game that seems to be so heavily devoted to combat. I did like the character design and look of the island itself. The quest sent me up and around an extinct volcano to retrieve the figurehead, where I finally confronted a a giant crab creature. After defeating it I replaced a missing totem on the island, removing the curse and restoring the islanders to their native state. The game gave me the option to just return the totem or to recarve it to make it look like me. Something I couldn't resist doing. A post game video showed me that if I had returned to the island later I would have been greeted by the locals as their god. A nice little bonus. Pirates of the Caribbean: Amrada of the Damned looks to play like a summer blockbuster, with plenty of eye-candy and lots of fast-paced action, but not a ton of substance. That's not necessarily a bad thing, it could be just right for a bit of mindless gaming when it hits the PC, PS3 and Xbox 360 this fall.